Almost too good 2B true. My experience with the NieR franchise is mostly limited to the release of NieR: Automata when it launched on the PlayStation 4 last year. I did play a few hours of the original NieR back on the Xbox 360 some 7 years ago, but I would be surprised if I played more than 4 or 5 hours of it. While not much has changed for this Xbox One release, at least in any substantial way, Xbox One gamers finally have the chance to play this wonderful action masterpiece. NieR: Automata explains its narrative through a few central characters. It is also pivotal that you don't stop playing once the first or second set of credits roll. In fact, the game isn't truly over until much later. During my 40+ hours with the game, I completed it a total of 3 times as well as testing out a variety of special bonus endings. The reason why I completed it three times is part of what makes NieR: Automata so intriguing, engaging, and original. Each of the three main playthroughs of NieR: Automata, which are technically called Routes, will have a different character as your focus and while the first two routes follow down a very similar path, it was the third time with the game that had me sold, a playthrough that almost felt like a sequel to what had just transpired. 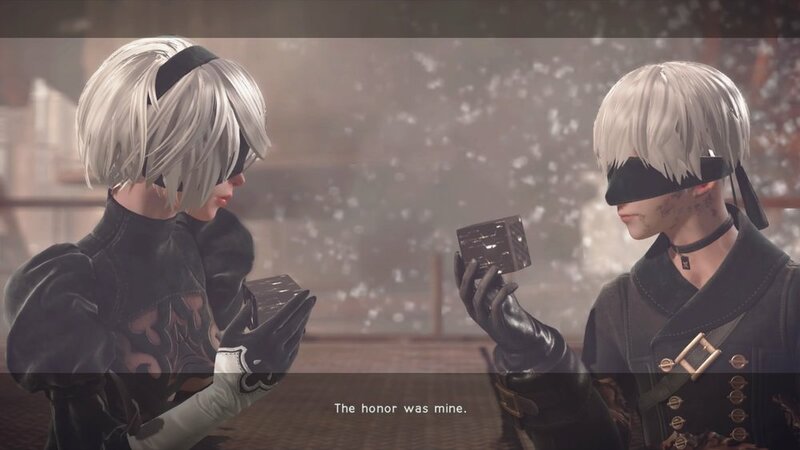 Your initial two campaigns differ only in the moments where 2B and 9S are separated, and those moments will show different aspects to the same basic story with a few small changes based on their point of view and through a few different gameplay mechanics unique to each character. If NieR: Automata has any drastic flaws, it is in the repetition between those first two playthroughs that could have been addressed and fixed in some way. 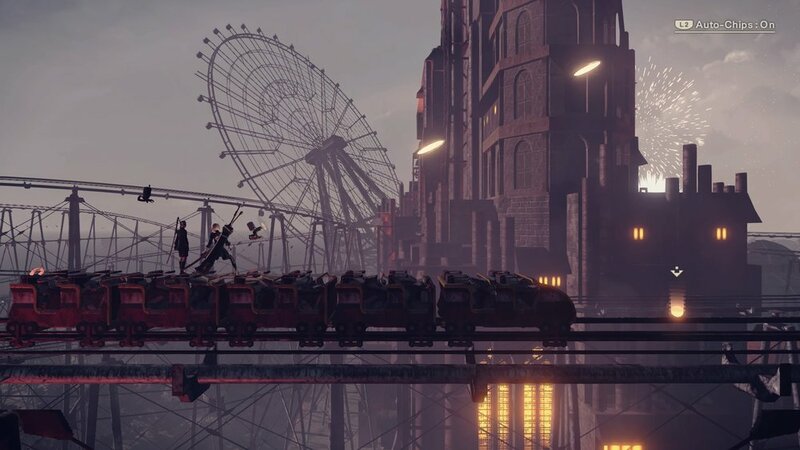 NieR: Automata is set in the year 11945 AD, far, far into our own future. An army of machines from another world had, long ago, forced humanity to flee the Earth to the moon. 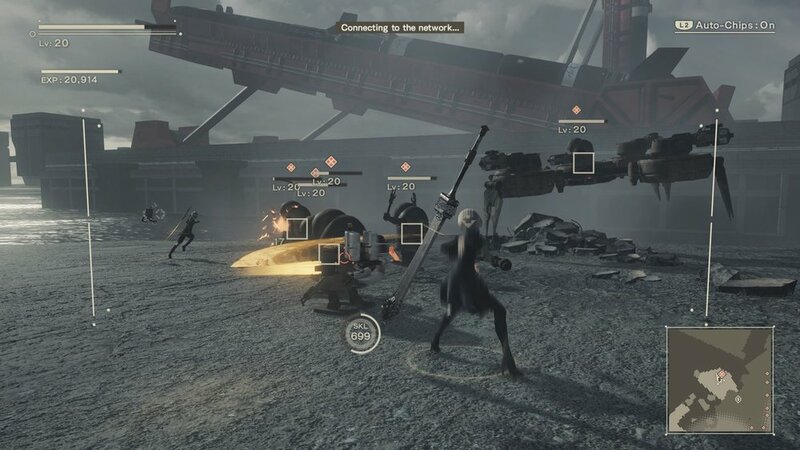 Desperate to take back the Earth, humanity then created combat androids dubbed "YoRHa" and sent them down to the planet's surface to fight the invaders in a proxy war. These androids are commanded from the Bunker, a control center in orbit above the Earth. While the story dives further into this fiction, it often will leave you with more questions than answers. Your main protagonist at the start of your adventure is No.2 Type B, or just simply known as, 2B. 2B is an all-purpose battle android that was created to battle the machine lifeforms that have taken over the planet. Dressed in a black dress with thigh high boots, 2B's white hair and black visor has become a cosplay sensation. Sporting the same black visor, blocking the view of their eyes, is her partner, No.9 Type S, also shortened to 9S. As a scanner-type android, 9S has basic attack functions, as his main focus is as an investigative unit with hacking abilities. 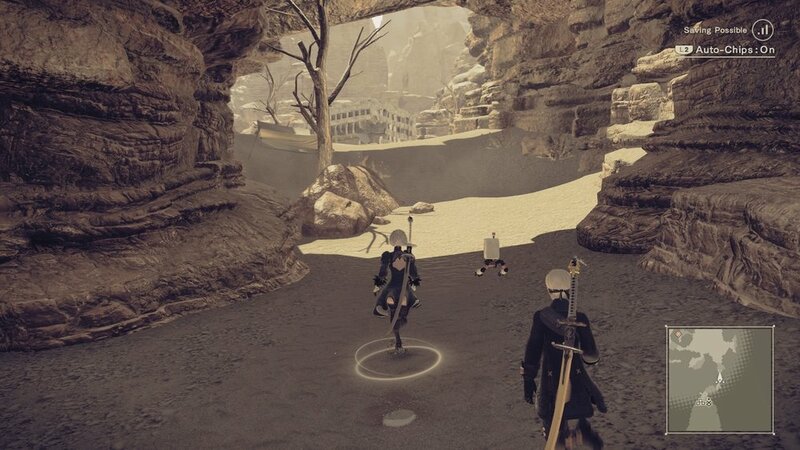 You will play as 9S during your second run through the game and while much of the same content is recycled, you do have access to new scenarios that occurred when you and 2B were separated during your initial playthrough. As you begin to lay waste to machines both big and small, you will eventually encounter A2, a woman with a mysterious past. A2 is easily my favorite of the trio and playing as her via the third playthrough was hands down the best content in the game. While it is very clear that 2B is meant to be the focal point of the game, A2 was just far more interesting than anyone else here. As much as I wanted to really enjoy 9S, it was the vast repetition of the second playthrough that made the character less interesting for me. While he never reaches high levels of annoying, it became a bit much to keep hearing the same dialogue recycled over and over again. While the trio of lead characters are well thought out and have some great characterization built into them, the same cannot be said for much of the supporting cast. Apart from Pascal, the machine from the woods who can be varying levels of entertaining, there are few of which I can even recall their names. You'll meet several characters from the village hub and some other locations you'll visit, but very few of these NPC's are memorable in any real way. The NPC's that you will interact with are mostly there to initiate side quests, but most of those tasks are simple and uninspired fetch quests. 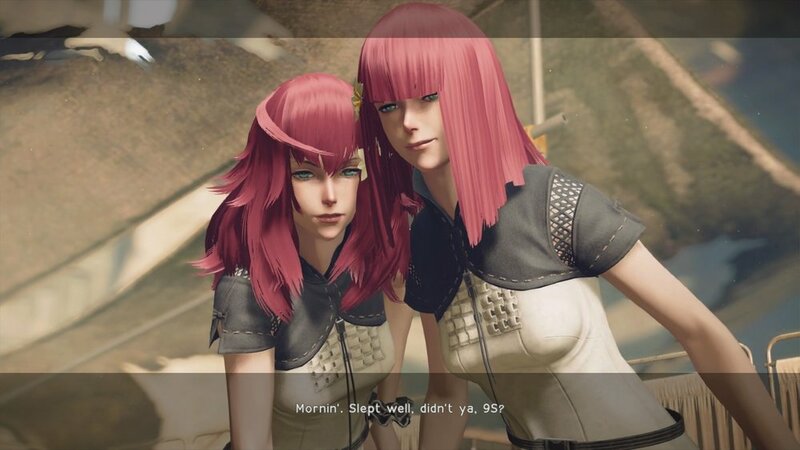 During one of the initial trailers for the game that showed off a few characters, I was very eager to eventually meet the pair of young girls; Devola and Popola. While your interactions with them are mostly inside the main camp, you do meet them again later on, but through less impressive results. I really wanted these two girls to feature a bit more prominently into the story as I loved their character designs and personalities. As you complete quests and destroy your fair share of machines, you will upgrade 2B, 9S, and A2. Thankfully, each character will carry over their upgrades, so you don't have to start all over again when you start up another playthrough. This allows the progression system to feel worthwhile and rewarding. The skills that you equip to each character is through a system called Plug-in Chips. The number of Chips that you can equip will vary on the space you currently have. You will begin the game with a limited amount of Chip capacity, but that can be increased later on via the Bunker. Chips vary in their purpose of boosting your attack, defense, health, or even automatic controls to have the game pretty much play for you. There are even Chips that will limit the HUD menu, damage numbers, or enemy health bars. Also, make sure you don't remove the OS Chip; you have been warned. Chips can be fused, but do note that this increases not just how effective it is, but how many spaces it takes up in your storage. Chips can be purchased through merchants or as drops from various enemies in the game. These Chips allow you to customize your character to the type of playstyle that you enjoy, so feel free to tailor them towards what you want from them. Should you fall in battle, you will have to track down your body in order to recover the Chips that you had equipped, so make sure to do that so they are not lost forever. While the system is built around restrictions and limits, I never felt that I was held back in creating a build that was to my liking. NieR: Automata has what you expect from a Platinum Games title, at least the good ones like Bayonetta, Transformers: Devastation, and Vanquish; fast-paced action with a solid combat system. Depending on the difficulty you choose, and of course what Chips you equip, combat can either be a total breeze or an insanely brutal experience. Most of your time will be studying enemy patterns, dodging out of the way of incoming projectiles, or utilizing your Pod companions as they can be equipped with skills such as gravity bombs, spears, lasers, and more. Eventually, you will unlock a second Pod and mixing and matching those skills to find a solid balance. You can equip a wide range of weapons from Katana's, Spears, Combat Bracers, and a massive selection of different Sword types. The combat will also vary depending on the camera angles, as the game will periodically shift to various angles that can dramatically change how you approach each encounter. One second you are playing a typical third-person action game and suddenly the camera will pan out and you are playing a side-scrolling fighter. You won't just take to your enemies on foot as there are several encounters where you will be piloting a massive flying Mech. While not exclusive to the Mech portions of the game, you will have to contend with dodging hundreds of enemy projectiles. These moments reminded me of arcade bullet hell shooters as enemies will launch vast amounts of projectiles that you will need to dodge. These missions are some of the best content available without being overused to lose their appeal. Packing in a wide range of boss encounters, both with either giant mechanical titans or smaller and more humanoid threats, the confrontations featured here are with some insanely cool designs. While most of your battles will be with various robotic creatures both big and small, it is the larger than life bosses and other threats that really enhance your experience. One such encounter is via the boss at the end of the Amusement Park attraction. While the level itself is fairly decent, its climactic finish is fantastic. My favorite battle in the game, by far, is when you are swapping back and forth between a set of characters battling two separate bosses that flow perfectly into one another. It is a masterwork of game design that pays off immensely and is one of my favorite boss encounters ever crafted. The Xbox One X version, while lacking a bit behind the PC port of the game especially with the use of some graphical assistance mods, slightly outperforms the PS4 Pro version by offering more than double the resolution but lacks solid blacks due to its poor implementation of HDR. Based on initial tests, Digital Foundry found that the game ran at 2160P with some possible checkboard rendering to hit that touted 4K resolution. High resolution aside, the game does drop below 60 fps often, especially during fights with either a lot going on or during the massive boss encounters. That aside, the game often looks sharper and crisper than the PS4 Pro version, but for those rocking a normal Xbox One S, you will be playing the worst possible version of the game as it fails to even match the quality of the normal PS4 which ran at 900p and still had performance issues. Much of the impressive visuals offered to us with NieR: Automata comes from its art design. While the game is mostly greys and browns, there are some outdoor locations that do offer up a great deal of green. There are locations that do break out of these basic colors, but the game, for the most part, contains a very muted look. The machines, its main cast of characters are all impressive, but it is the NPC's that feel as if they were lifted from a far worse looking game. The title will often switch perspectives taking the third person camera away and either swapping out to a top-down shooter or a side-scroller action game. It is in moments like this where the art design can change as well. The side-scrolling environments often have background assets that create a large sense of scale and these moments are pulled off extremely well. Few titles in this genre play up with how the camera can dramatically change up not only the action but the type of game you are playing. One of the best aspects of NieR: Automata is in its soundtrack. Composer Keiichi Okabe, who is no stranger to have worked alongside game director Yoko Taro on the original NieR, has given us one of the best gaming soundtracks in some time. Okabe created multiple musical selections that allow different tracks to transition into one another depending on the situation and environment. Despite working on the original NieR, Okabe shifted the tone away from music that complemented grasslands and villages to one that fit alongside a more mechanical and brutal tone. There is so much fantastic vocal work provided by several performers that left me with chills during several moments in the game. As this is a content complete edition for the Xbox One, gamers will be treated to the base game, the expansion DLC, a Grimoire Weiss Pod, a machine lifeform mask assessor and three skins: Retrod Red, Retro Grey, and Carboard Pod. This DLC pack contains an arena mode to earn new costumes, cosmetic items that can change the appearance of enemy projectiles, and hair dyes for both 2B and A2. There are some short story sequences as well as some brand new boss encounters, but to truly enjoy this extra content, you should be extremely high leveled before diving too far into it. Despite the fun action, great set of lead characters and a killer soundtrack, there are a few flaws that did hamper my overall experience with the game that comes from its open world and how you traverse it. The navigational map is extremely hard to follow and resulted in me hitting several dead ends or heading off in the wrong direction entirely. Had you been able to set objective markers that could be seen outside of the map, then that may have alleviated the problem at least a little bit, but as it stands, getting around this large open world by having to open and close the map numerous times became more of a chore than anything else. The open world itself can often at times feel bland and after coming in from an explosive first chapter to be dropped into the slow pacing that this area first offers can cause the flow of the game to feel like someone slammed on the breaks. There are also several instances where missions will reuse key areas over and over again and this can cause several wonderfully designed locations to lose a bit of their charm. 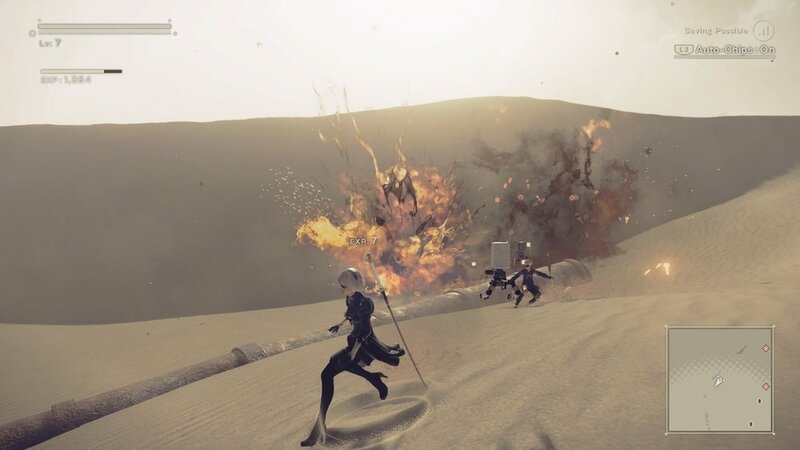 NieR: Automata's stunning soundtrack combined with its fast-paced combat delivers one of the best action games in years. While it does have some pacing problems, mostly due to its open world, the game is at its best when it's delivering on that action and it does so in spades. The upgrade and loot systems consistently impress and with the addition of the expansion DLC, this is the most complete version out there. If you own an Xbox One X, then this is the chance for you to take in this fantastic title, but if you own a PS4 or PS4 Pro, then you can track down this game and its DLC for a bit cheaper than its current asking price on the Xbox Digital Store. Either way, this is one action game you don't want 2B without. NieR: Automata was purchased by the reviewer and this review is based on time with both the PS4 Pro and the Xbox One X versions. All Screenshots were taken from a PlayStation 4 and Xbox One X.